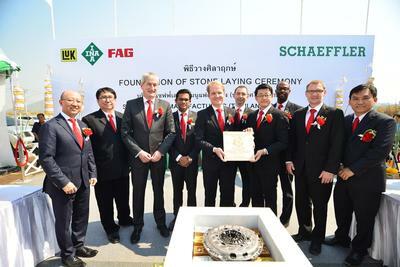 Schaeffler, a leading global automotive and industrial technology company, organized the foundation stone laying ceremony for a Greenfield manufacturing facility at Chon Buri, Thailand. The new facility, located at the Hemaraj Chon Buri Industrial Estate II, will significantly expand the production footprint of Schaeffler in Asia Pacific and especially in South East Asia with the introduction of new product lines. This is one important milestone of the strategic expansion of local manufacturing as well as research and development footprint in the region. "Expanding our manufacturing footprint in Southeast Asia reflects our commitment to this region and allows us to better serve customers with our advanced products and solutions. The automotive industry in Thailand and Southeast Asia is poised for continuous growth," said Mr. Andreas Schick, Chief Executive Officer at Schaeffler Asia Pacific. The new manufacturing facility will be built at a 55,000 sq. m. site in Chon Buri province on the eastern coast of Thailand. Construction of the plant is commencing as scheduled and start of production at the plant is planned in the first quarter of 2016. The product lines that will be launched in phase 1 include clutch discs and clutch pressure plates, mechanical and hydraulic belt tensioners, syn-chronizer rings, clutch release bearings and clutch release systems. "Thailand is one of the key automotive manufacturing hubs globally with the highest concentration of manufacturing and research facilities of automotive OEMs. The country has witnessed robust industrial growth over the past few years. In addition, the government of Thailand gives strong emphasis to the development of automo-tive and ancillary industries. Thailand has very good skilled workers and competitive labor costs," said Mr. Masafumi Yoshida, President Automotive at Schaeffler Southeast Asia. "The opening of our new plant in Thailand will strengthen our customer proximity in the entire Southeast Asia region. Strengthening our operational and engineering competence in the region enables us to respond more quickly to changes in the market. The integration of ASEAN Economic Community (AEC) in 2015 will bring added benefits to the automotive industry. In this context, local sourcing will contribute to improved competitiveness of our customers as they can get advantages like government tax incentives, faster deliveries and flexibility in production planning," explained Mr. Yoshida. The megatrends globalization, urbanization, digitalization, scarcity of resources, renewable energies and the growing requirements for affordable mobility are leading to changed, much more dynamic market requirements and business models. Schaeffler has developed its growth strategy to fulfill these changed market and customer requirements and utilize the enormous growth potential. Eco-friendly drives, urban and interurban mobility as well as the energy chain are the areas of focus, which Schaeffler is actively shaping by carrying out its own research and development in cooperation with its customers and business partners. Schaeffler sees tremendous potential to apply this broad technical know-how in the emerging growth markets of Asia Pacific. The region is closely integrated with the company's global network of research and development units as well as manufacturing plants and facilities. Schaeffler utilizes these synergies and promotes extensive transfer of know-how and expertise within this global network to be a development partner for customers in markets they operate. Schaeffler operations in Korea, Japan and the countries in Southeast Asia-Pacific represent the Asia Pacific (AP) region which is managed from the regional headquarters in Singapore. With seven manufacturing locations and research and development facilities at five locations, the AP organization ensures that customers in the Automotive and Industrial divisions are served rapidly with applications specific to their needs. Schaeffler is actively strengthening the local manufacturing and engineering footprint in the AP region to meet the growing customer requirements of localization and application development.